August 26, 2014, 10:55 a.m.
Barack Obama is back in the White House today after spending most of the last two weeks with his family on Martha’s Vineyard, an island off the coast of Massachusetts. Of course, the vacation was not really much of a getaway – aside from a two-day trip back to Washington midway through the vacation, Obama also received daily briefings, made calls to world leaders and delivered four statements, among other responsibilities. But the president also managed to play nine rounds of golf, leading critics to claim he was disengaged with the crises igniting at home and abroad, including protests over the shooting of an unarmed teen in Ferguson, Missouri and the beheading of an American journalist in Iraq. Obama is not the first president to be taken to task for spending too much time away from the White House, or even for spending too much time hitting the links. Bill Clinton was also criticized for going to the wealthy island of Martha’s Vineyard while Americans were hurting financially, and one of Obama’s own former aides once slammed Clinton’s Republican predecessor, George H. W. Bush, for his golf habit (he now says the criticism was wrong). 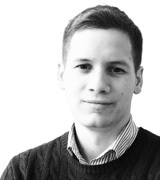 Voters are reluctant to jump on board with the golfing criticism, at least in principle. 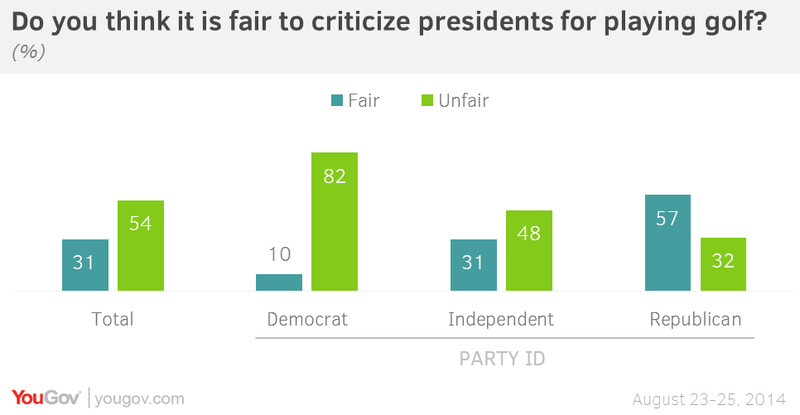 54% of Americans say it is unfair to criticize presidents for playing golf, against only 31% who say the criticism is fair. Most Democrats and half of independents call the golfing criticism unfair, along with a sizeable (32%) minority of Republicans. When asked specifically about whether the current president plays too much golf, Americans are less prepared to dismiss the criticism. 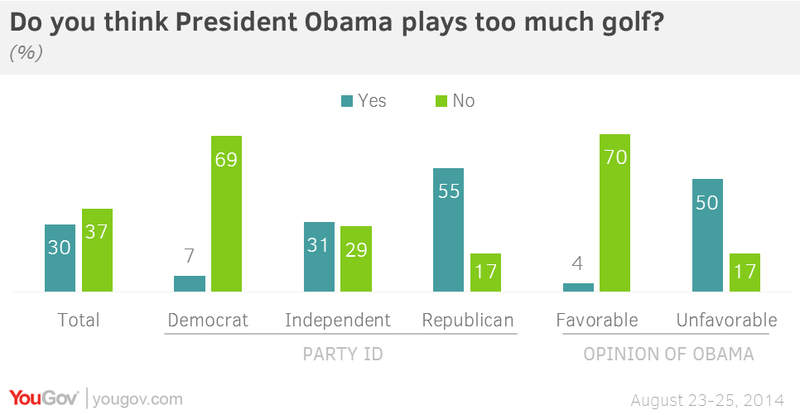 Only 37% say definitely that the president doesn’t play too much golf. Still, even fewer (just 30%) believe he does – the rest (33%) are unsure. Questions that mention President Obama have been shown to lead to more predictably partisan responses on policy issues, and these findings follow a somewhat similar pattern. The opinions of Republicans, who mostly think Obama plays too much golf, and independents, who are split on the question, look a bit more like the current president’s favorability numbers when his name is mentioned. However, compared to the 87% of Republicans in the survey who have an unfavourable opinion of Obama, the 55% who say he plays too much golf could seem small. Among all the respondents who have overall negative opinions about President Obama, only half go on to say he plays “too much” golf, revealing a significant number of Americans who are otherwise unhappy with the president, but unprepared to extend their opprobrium to his golf habit. By contrast, only 4% of those who see the president favorably think he plays too much golf.